The past is a strange country: Gillian Greer admires the gentle craftsmanship of Barney Norris’ new two-hander, the inaugural production in the Bush’s new studio space. While We’re Here, Bush Theatre. Photo: Mark Douet. The past, L. P. Hartley tells us, is a strange country. They do things differently there. This assertion is abundantly clear in Barney Norris’ While We’re Here, a story of two ex-lovers colliding twenty years after their affair ended. Strange though it may be, Carol (Tessa Peake-Jones) and Eddie (Andrew French) have their passports at the ready when a chance encounter at a bus stop leads to Eddie sleeping on his former flame’s couch, indefinitely. Over the course of a beautifully crafted seventy minutes, they cobble together the lives they’ve made since they left one another, and attempt to sew their disparate strands back together again. What comes next is a quiet, considered comparison of how their paths have diverged, twisted, turned and somehow led back to one another. Carol was first caught up in an affair with Eddie after her husband left her, and has since constructed for herself a life of stability and solitude. She is, as she proudly proclaims, a Team Leader in Electoral Registration, a maker of endless pots of tea and the mother of a daughter who never calls. James Perkins’ set, with its sad cushions and lovingly hung baby photos, carries all the echoing melancholy of an empty nest. In contrast, Eddie has slipped through society’s cracks. After suffering a mental breakdown, he fled the UK and drifted from country to country, plagued by a bleak cloud of anxiety and depression, nothing but a few shopping bags of letters he can’t read left to show for his earthly toil. Andrew French’s performance as Eddie is manic, if a little disingenuous: Eddie’s affectations may seem charming as he waxes lyrical to Carol about his dream of rewilding and the success of the red kite population of Oxfordshire, but there is little sincerity behind his eyes. One wonders how many times Eddie has played this part before. It’s fitting that this should be the inaugural play for The Bush’s new studio space: playwright Barney Norris seems most interested in placing his characters in close quarters and watching how their chemistry develops. 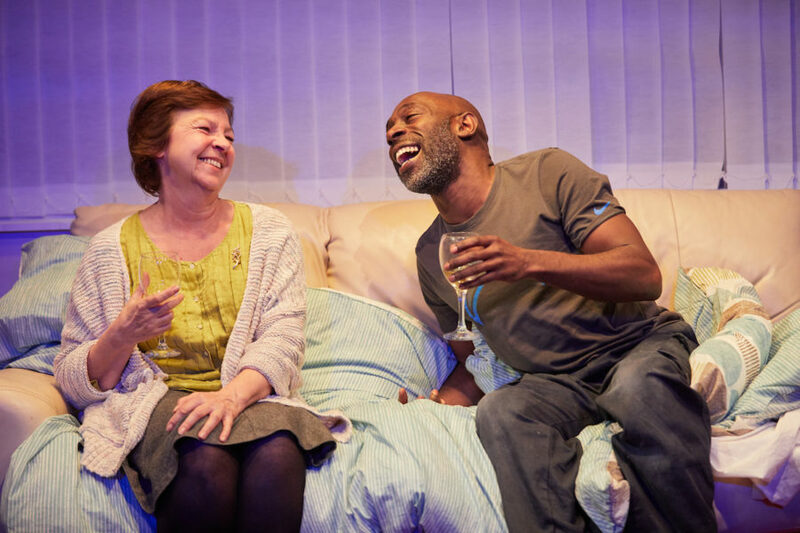 The play is at its most powerful when it is exploring the mundane: amiable prattle about television programmes, property and bank accounts feels oddly liberating – one gets the sense that simply being listened to is a revolution for this adrift pair. It struggles then, when plot rears its arduous head: implications that Eddie isn’t quite who he seems to be are never explored, the depths of Carole’s heartaches scarcely plumbed. Tessa Peake-Jones’ performance is a lesson in empathy, her uncertain lilt and wide-eyed hospitality a shallow veneer for an almost all-consuming loneliness. Whispered comparisons to mothers and mothers-in-law alike were overheard as we left the auditorium. While We’re Here may not be explosive, but Alice Hamilton’s self-assured direction produces a satisfying simmer. Carol’s final monologue in particular is a heart-wrencher, its quiet desperation inspiring a text to my own Mam to tell her that I love her and that I’ll be sure to call home later in the week. While We’re Here is at the Bush Theatre until 27th May. For more details, click here.